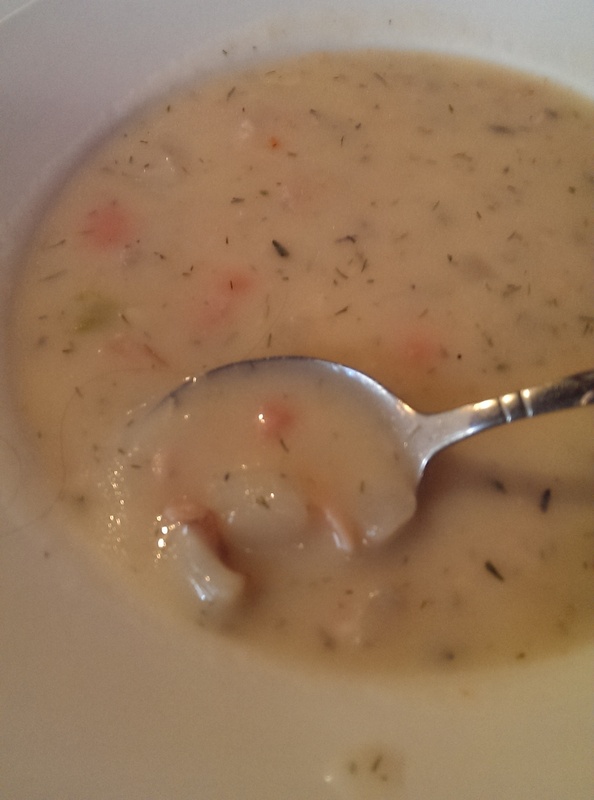 What Merwin’s Wharf lacks in food quality, it makes up for in atmosphere. I met a friend there for dinner on a recent Tuesday. 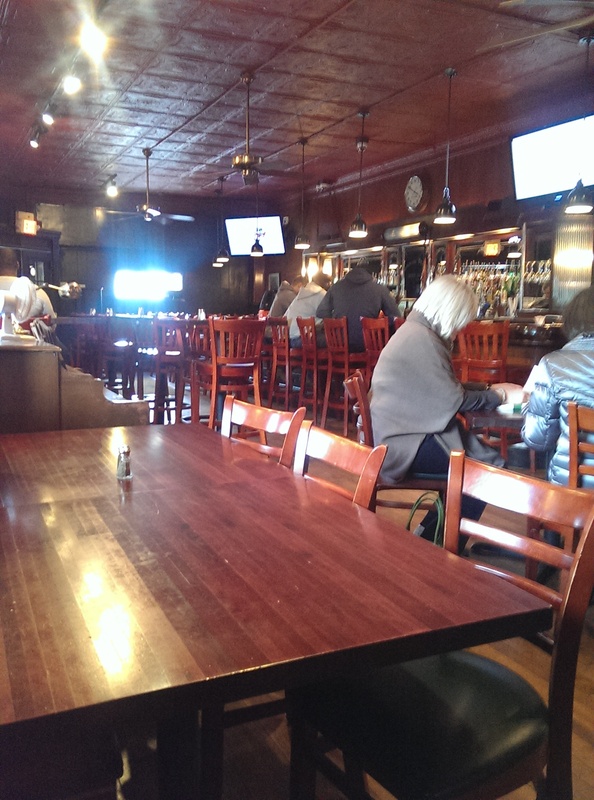 There was a one and a half hour wait for a table (on a Tuesday), but my friend quickly found two people leaving at the bar and snagged their seats. The location is the big draw. 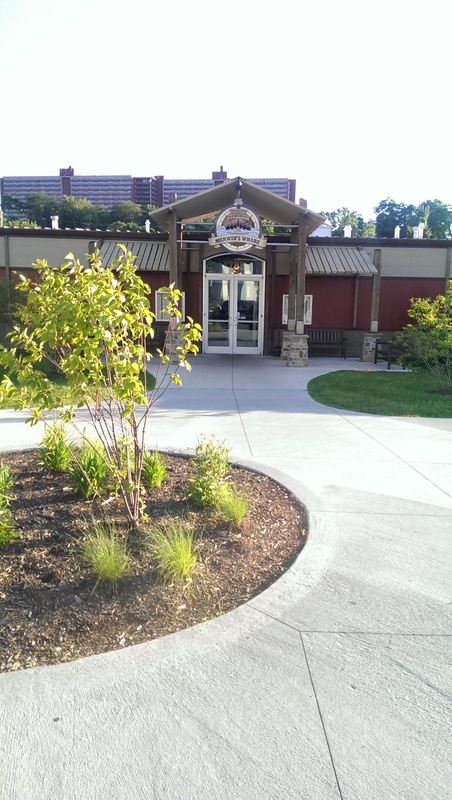 Located on the banks of the Cuyahoga River, Merwin’s Wharf has a large patio with a fire pit, a gas fireplace, and a giant Jenga, lots of windows and a great view of the boats and river traffic. 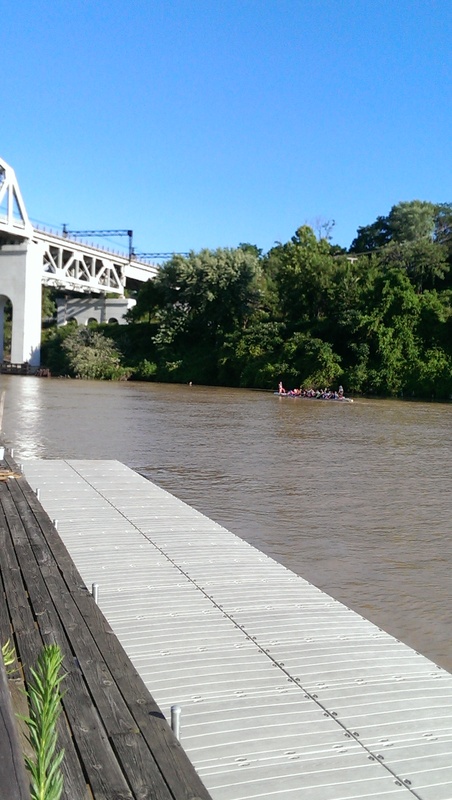 I saw a rowing crew counting out their strokes and the Goodtime III drove by at one point. My friend commented that they should have the bar facing the river, but the design allows the servers and food runners access to the kitchen (note I didn’t say quick access, because several orders sat there for a pretty long time). Things got better once the manager came out to expedite things. 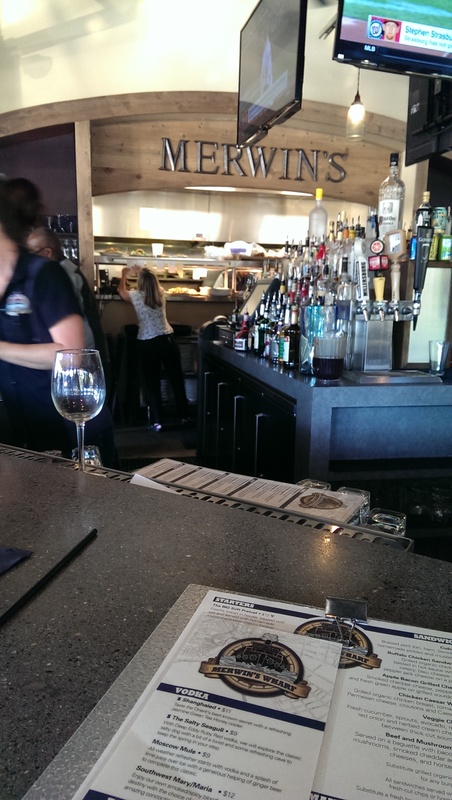 I was underwhelmed by the food, but I loved the drinks. 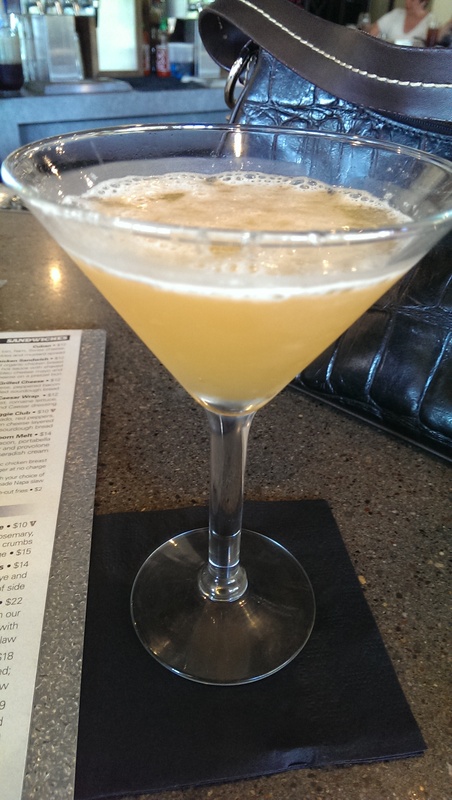 I started off with a Hemingway’s Day Off, which was delicious. It features rum with a little lime and is finished with basil syrup. I saw no sign of the “seasonal fruit” mentioned in the description, but it really didn’t need it. I drank it down quickly and enjoyed every sip. 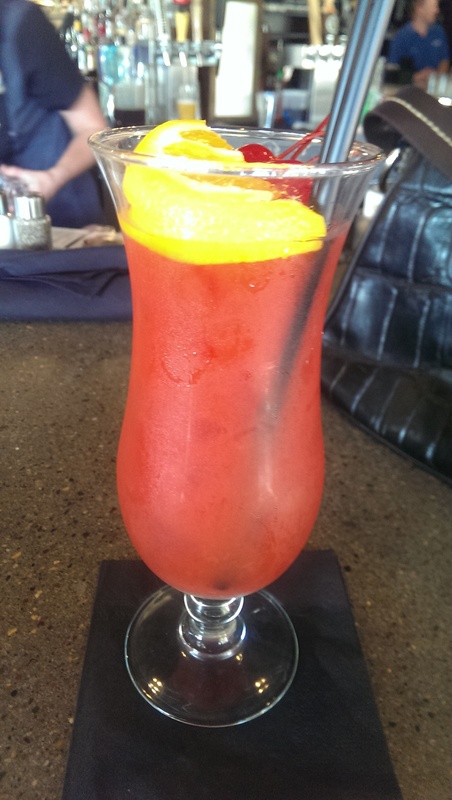 I then ordered a Rum Runner, which features light and dark rum, banana and blackberry liqueur, orange juice, pineapple, Grenadine and 151 Rum. It was also delicious, and I had to ask the bartender for water because I was afraid I would drink it down too quickly without any food. I didn’t get my water until I finally was able to ask the runner who brought the food for one. The bar was slammed, but the bartender had obviously forgotten my water. As far as the food is concerned, it isn’t the best food, but it is okay. 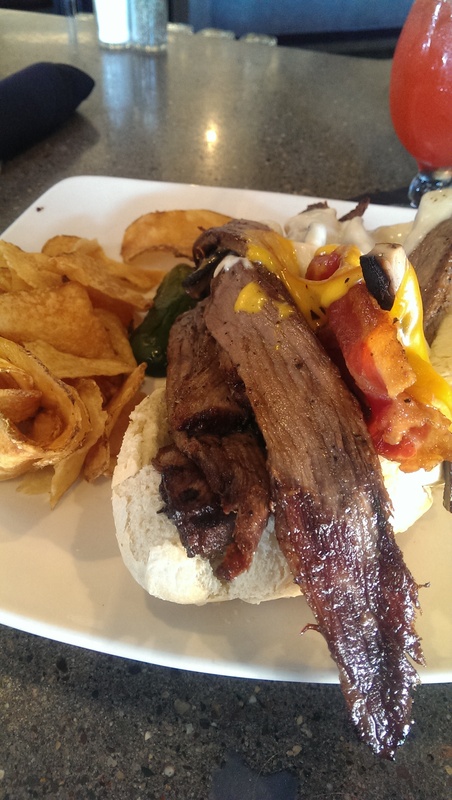 I ordered the Beef and Mushroom Melt. I don’t know if it had sat under the heat lamp for too long, but the thick-cut beef was tough and the “melt” was pretty dry. There wasn’t much horseradish cream that I noticed and as you can tell the cheese was also pretty meager. The fresh cut potato chips were decent. I think a shaved beef would make this a much more successful sandwich. 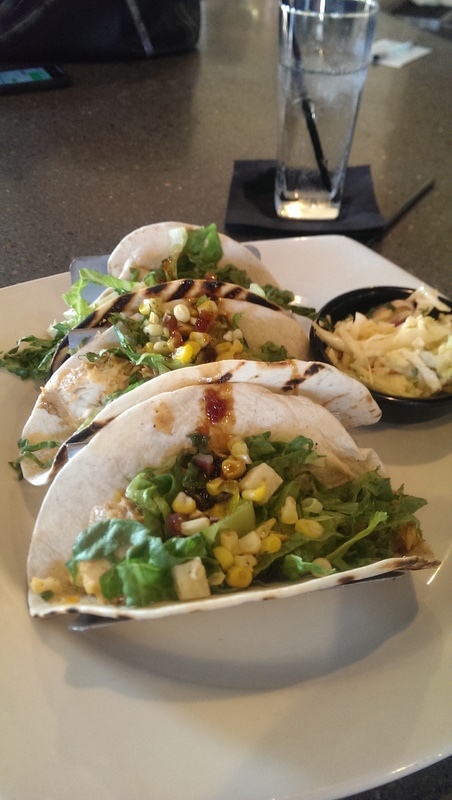 My friend ordered the fish tacos. The fish was walleye and it had a nice amount of veggies accompanying it. She said the tacos were okay but a bit bland. She said they could really use the addition of some kind of crema or creamy topping. 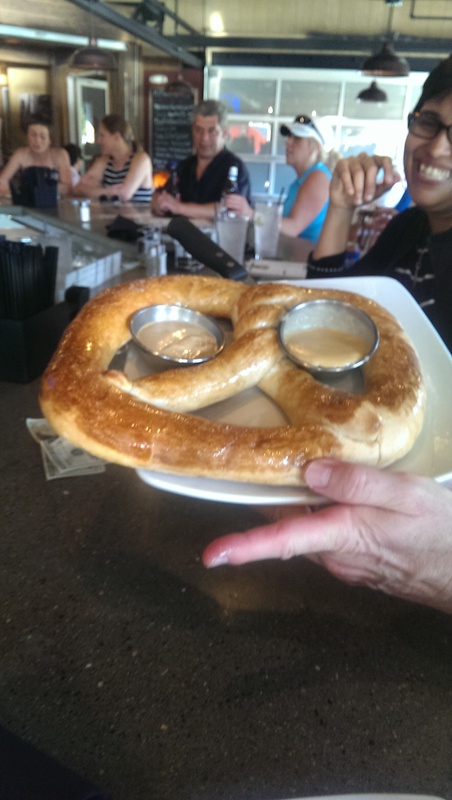 A fellow patron at the bar also offered us a bite of their giant pretzel with mustard and beer cheese. The biggest thing it has going for it is the size. It was gargantuan. It was doughy but didn’t have the nice crispness I am used to. The mustard and beer cheese dips were tasty and were needed to give it some flavor. It was nothing like the pretzel at the Hofbrauhaus or any pretzel in any backyard beer garden in Germany. The pretzel was more like a bit dough bowtie than a pretzel. In any case the two of them were having trouble finishing it, which is why they offered us a taste. 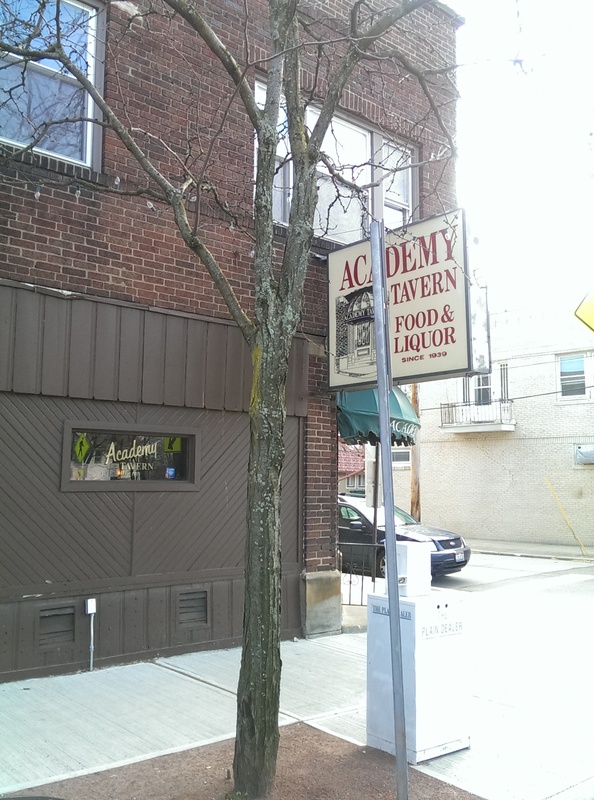 I guess it would do a good job soaking up the alcohol, so it is a good bar choice. This is definitely a place to go for drinks. Just don’t expect too much from the food. Or the service. I have heard complaints about rude hosts/hostesses, and I was not impressed with the time it took to run food out once it hit the kitchen window. Go for the drinks and the view. You can wave at the Goodtime III when it goes by. 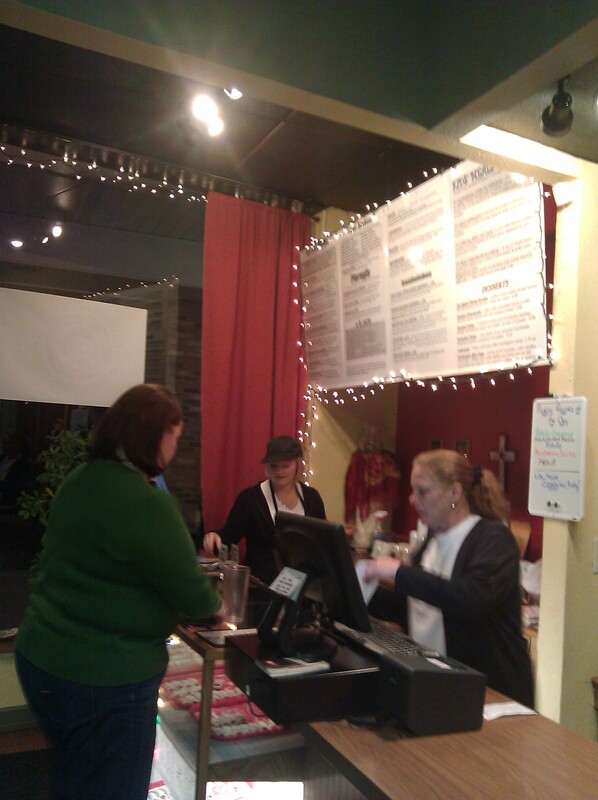 My dining out group recently ate at Babushka’s Kitchen in Independence. The restaurant in Northfield was closed for renovations at the time, so we decided to check out the newest location in Independence. It is worth mentioning that it is impossible to see from the street. It is tucked in the middle of the Independence Square shopping plaza. Look for the shopping plaza with the Independence water tower on the periphery, and you’ll know you are in the right place. Thank heavens for GPS, because I never would have found it otherwise. 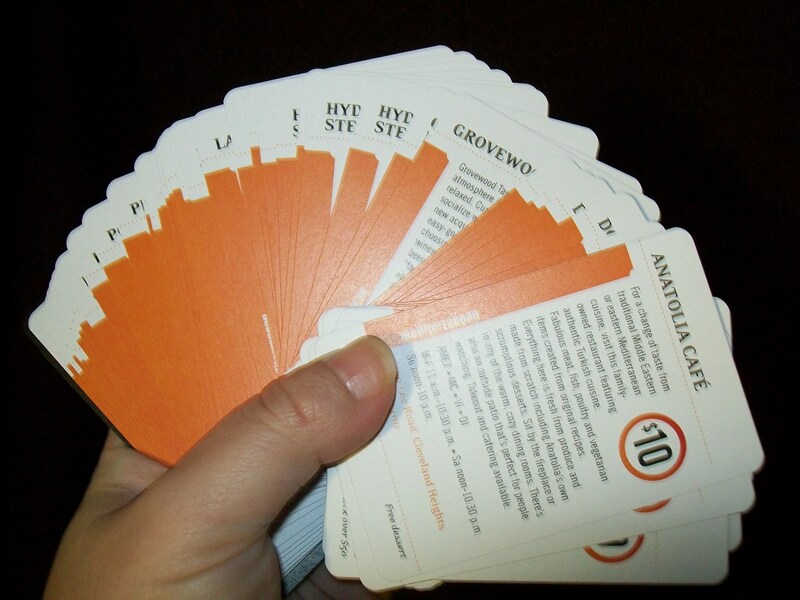 The restaurant is a “casual quick-service style cafe” featuring pierogi, stuffed cabbage, kielbasi, roast pork, dumplings and all those Eastern European favorites. You order at the register in the front of the restaurant, you are given a number, and the kitchen staff brings your order out to you from the kitchen in the back. This isn’t fancy dining by any stretch of the imagination, but if you want comfort food your grandmother (well, okay, *my* Ukrainian grandmother) used to make you will be very pleased. The pierogi are to die for! They are advertised as jumbo pierogi, and boy are they. The night we were there they had several flavors on offer – potato, potato and cheddar cheese, mushroom and Swiss, and sauerkraut. There was one other flavor, but I don’t remember what it was and I can’t read it on the dry erase board in the photo. 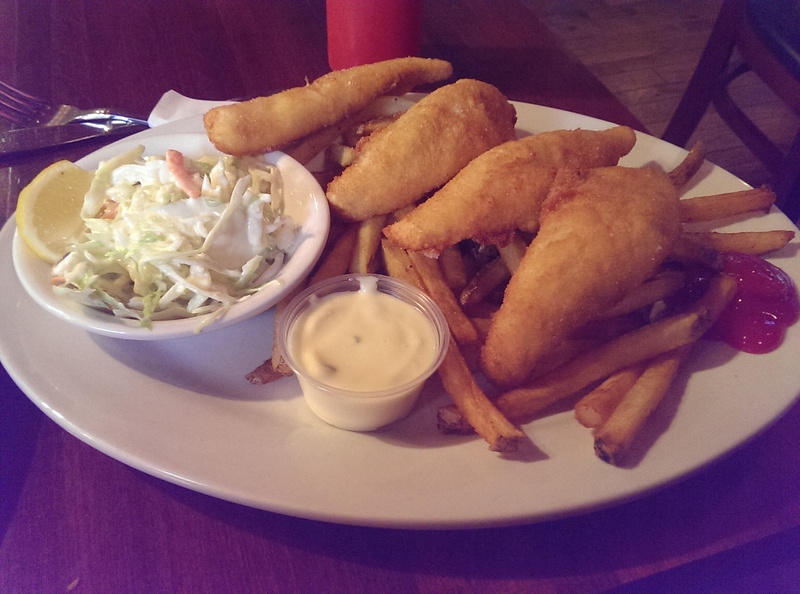 They offer several platters to allow new customers to try a variety of their entrees. 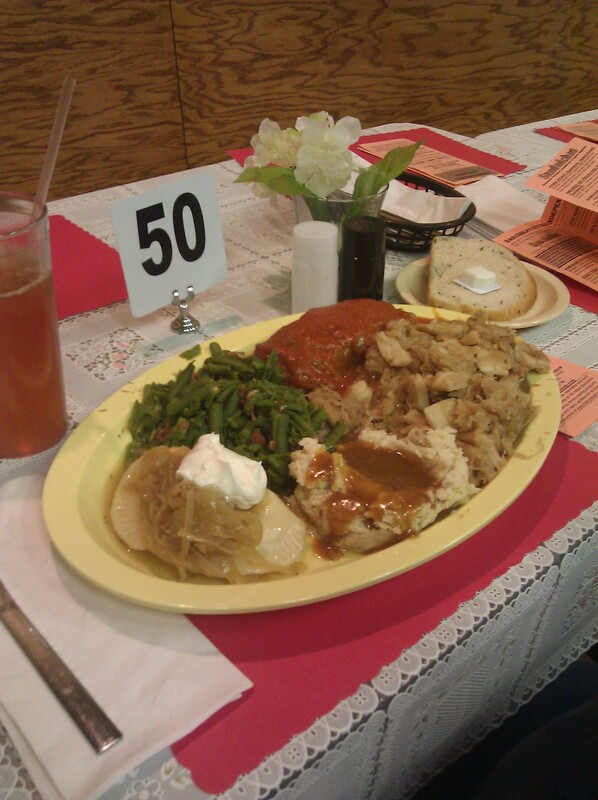 The platters come with your choice of one or two side dishes, which include soup, green beans, kraut & noodles, mashed potatoes & gravy (red or brown), and cinnamon applesauce. There may be one or two that I can’t remember. The tables were practically groaning from all the food that was brought out. No one went home hungry – that is for sure! 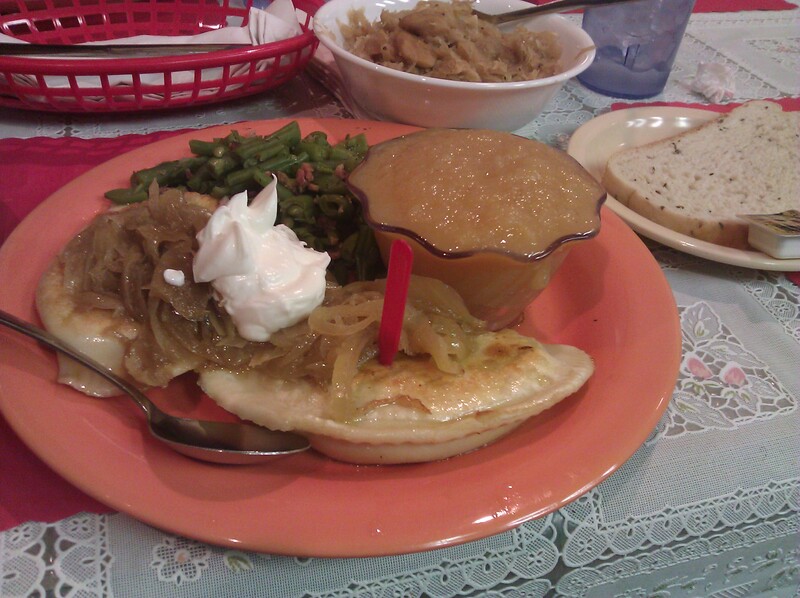 I chose Grandma Olga’s Favorite, which features two of the jumbo pierogi with grilled onions and sour cream, two side dishes and a slice of rye bread and butter. I also ordered a cabbage roll on the side. It was HUGE! One of these and a side would have completely sufficed. For my side dishes I chose the applesauce and green beans and bacon. The beans were canned not fresh, but I am a huge fan of canned beans and prefer them over fresh (I blame my school lunch indoctrination). The cinnamon apple sauce was perfectly seasoned and was the perfect accompaniment to the heavy entrees. I wasn’t that thrilled with the cabbage roll, but I have high standards. It was simply too sweet for my tastes. 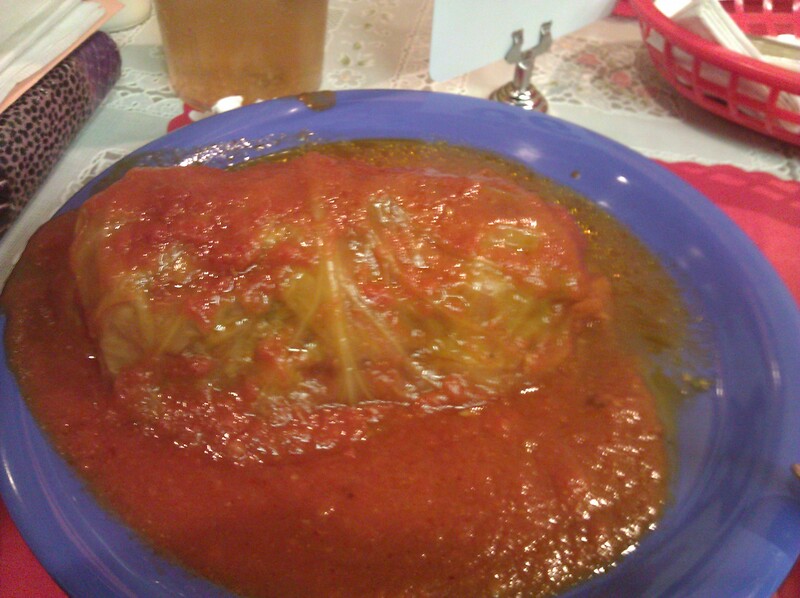 I prefer Sokolowski’s cabbage roll because it is more savory than sweet. Other people loved it. I absolutely adored the jumbo pierogi. I chose a mushroom and Swiss and a potato and cheddar. Both were delicious. One of my fellow diners also gave me his side of kraut and dumplings, which was also quite tasty (although the kraut was slightly overcooked). I had so much food that I took most of it home. I am intrigued by The Warsaw, which is a large potato pancake layered with grilled onions, sliced pork loin, sauerkraut, pork gravy, then topped with another potato pancake and a dollop of sour cream, served with any side dish or cup of chicken noodle soup. I will probably get this next time. 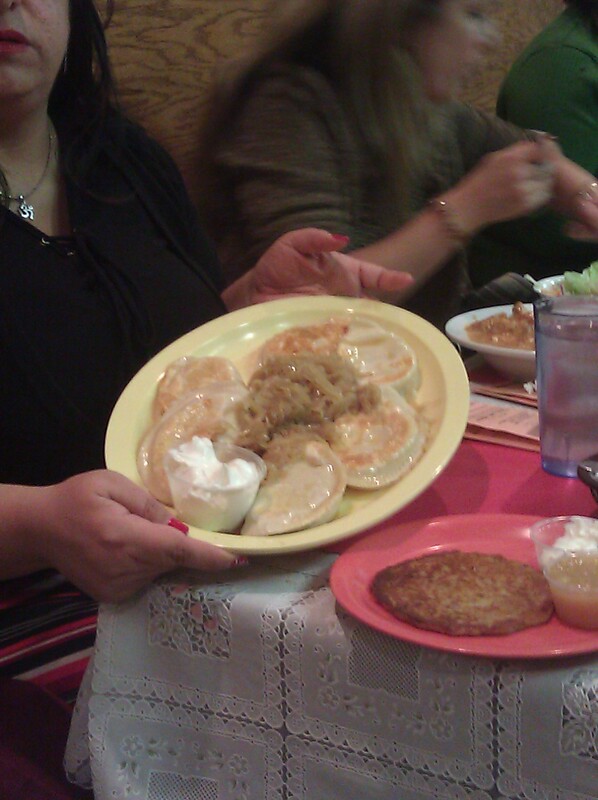 No one ordered this that night, but my friend M. ordered a potato pancake as a side (see above photo of the pierogi platter) and several people had the roasted pork with their meal and loved them. If you can’t decide what to order, I suggest getting the Hunter’s Feast, which features one stuffed cabbage, a link of smoked kielbasa, roasted pork with sauerkraut & dumplings, one jumbo potato & cheese pierogi with grilled onion and sour cream and your choice of two side dishes, or the Gatherer’s Platter (photo above on the beige platter), which features one stuffed cabbage, one jumbo potato & cheddar cheese pierogi with grilled onions & sour cream plus your choice of one side dish. You will be stuffed! 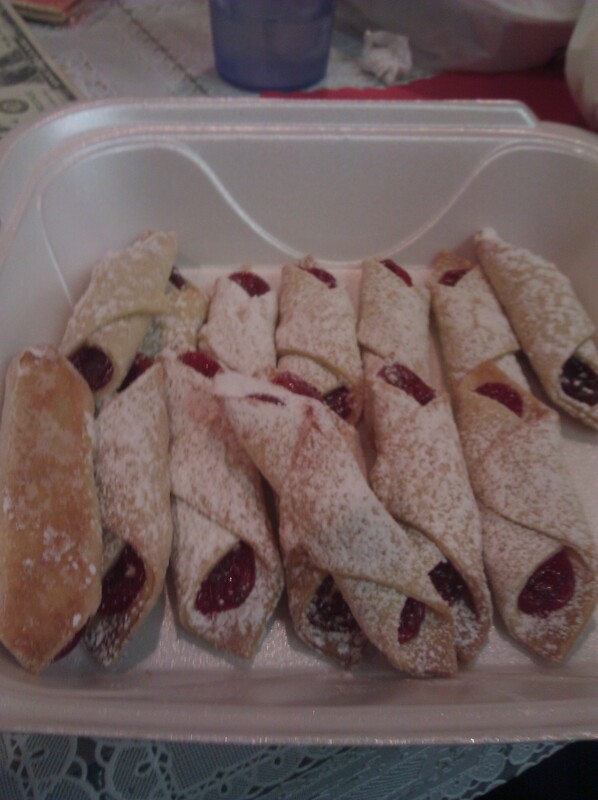 I bought two dozen kolachky, which were just as good (if not better!) than my grandmother used to make, to share among my fellow diners and took the leftover kolachky home. I need to go back for more soon! The kolachky were flaky and melted in our mouths. The only flavor left by the time I bought them was raspberry, but that was fine with me because that happens to be my favorite. Apricot would be a close second.